This valuable and unique ADT Movers Relocation Guarantee states that if you move from your home to a home anywhere in the U.S. after you have had your system for two years, ADT will provide you with a Premium Mover’s Package. This package entitles you to a Free ADT Security System for your new home. Additionally, your are given an extra 25% discount on equipment upgrades! This represents value of up to $849. Please read the certificate for all of the details. Only ADT Can Offer You These Levels of Protection and These Valuable Guarantees. ADT is the Nation’s Largest Security Company and Also Have the Largest Coverage Area of Any Security Company in America. Disclaimer – To qualify for the Relocation Discount Guarantee you must have been with ADT for at least two years and your ADT account must be in good standing. You must also provide ADT with the name and telephone number of the occupant of your former residence. This discount cannot be combined with any other offers and is available for residential customers only. 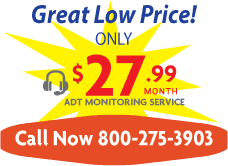 We are an Authorized ADT Security Services Dealer providing stellar services to homeowners since the inception of the ADT Dealer program in January, 1996. ADT and ADT Security logos are registered trademarks of ADT Security Services Inc. American Guardian Security Systems, Inc.